In his controversial war memoirs, Himalayan Blunder – a curtain raiser to the Sino-Indian war of 1962 (1969), Brigadier John Dalvi, a POW during that war, narrates an incident from his days as an instructor at the National Defence Academy, Pune. A guest faculty, a retired British official, after hearing that Nehru had signed the Panchsheel agreement with China and had decided to give up the post in Tibet that the British had maintained to check Chinese advances, interrupted his class and warned that India and China would soon be at war and that people in the class would be fighting it. Brig. Dalvi remembers how he was very angry with this gentleman and how he questioned his authority to criticize the leader of his country. In stark contrast, he describes his return to India on being repatriated by China, in a highly sceptic manner - "We landed in Dum Dum airport in Calcutta on May 4, 1963. We were received cordially, appropriately. But the silence there was disquieting. I realized later. We had to prove we weren’t brainwashed by Chinese ideology. We had to prove we were still loyal to India. My own army maintained a suspicious distance. The irony cannot be harsher: this treatment from a country, which for more than a decade had brainwashed itself into holding the Chinese baton wherever it went [emphasis added]." It’s 2012, exactly half a century since that Chinese ‘blitzkrieg’ against India, but such scepticism about the Indian government’s myopic view of China’s intentions, going back to the Nehruvian era, reigns high in sections of our defence establishment, and time and again given voice by a section of the Indian media. Two separate reports in 2009 and 2011 have predicted military aggression from the Chinese side in 2012. The former report was authored by Bharat Verma, Editor of the Indian Defence Review. It asserted that to divert the attention of its own people from “unprecedented” internal dissent, growing unemployment and financial problems threatening the hold of Communists in that country, China would launch an attack on India before 2012. More recently, Colonel (retired) Anil Athale, author of the official history of the 1962 India-China conflict and now coordinator of the think-tank Indian Initiative for Peace, Arms Control & Disarmament, charged that the government of Prime Minister Manmohan Singh had failed to prepare the country's armed forces to fight a likely war against China, which he warned could come as early as June/July 2012 in the form of “a short, sharp, attack by the Chinese, more in the nature of a slap!" The hysteria created by such assertions is being augmented by certain sections of the Indian media which remain hell bent to portray India as the focal point of China’s foreign policy. Any minor military development on the Chinese side of the 3380 km disputed Sino-Indian border or any diplomatic skirmish is blown up and presented as Breaking News by such media outlets. South Block has been rubbishing all such claims, with the Prime Minister himself coming forward to clarify matters. However, pessimism, as being showcased by certain sections of the Indian military establishment and the India media will not help in engaging with the other Asian giant. The Indian Government must follow the path of cautious optimism to ensure that the fruits borne by the seeds of bilateral talks with China in the last two decades do not turn sour. India and China have come a long way from the shadows of the war fought half a century ago. Today, the two countries are working ‘hand-in-hand’ in the international arena while representing interests of the developing world in the Doha Round of WTO and Climate Change talks. With China becoming India’s biggest trade partner back in 2008, there is an increased economic dependence between the two neighbours. As per figures released in January, the bilateral trade hit a record USD 73.9 billion last year. Underlining the need for closer ties with India, Chinese State Councillor Dai Bingguo, said to be close to Chinese President Hu Jintao, wrote in an article in The Hindu recently, "We speak with one voice and enjoy increasingly closer coordination and collaboration in multilateral mechanisms and in tackling global challenges." "What we face is a golden period to grow China-India relations. The world has enough space for China and India to achieve common development, as there are so many areas for us to work together," he added. In this light, while the Indian Government should continue looking at relations with China with optimism, it should meanwhile strengthen its borders with China, infrastructurally, more than militarily, and ensure that Indian Ocean doesn’t become a fiefdom of any particular country. Economic interests of India in Africa, Central Asia and South-east Asia vis-à-vis China should also be safeguarded. Efforts should also be made to decrease the USD 27 billion trade deficit that stands at the moment in favour of China. Moreover, the increasing influence of China over other Indian neighbours should be countered by better socio-economic engagement with these countries. 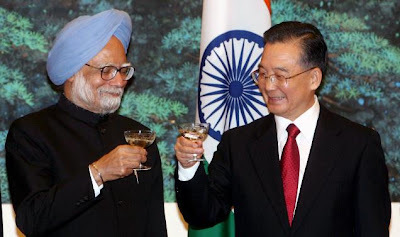 According to India's erstwhile foreign secretary and former Ambassador to the United States, Lalit Mansingh, India's answer to China's "string of pearls" in Asia, particularly South Asia, is its own "necklace of diamonds". "It is clearly emerging that China's policy is a kind of method by which they not only promote economic interests, they are actually trying to keep India boxed in within the South Asia context. And this is where we have to respond to their so-called string of pearls," he said, while addressing a conference on India as a Global Power. Mansingh noted, "It is not that they have done anything wrong in having agreements for building naval facilities in our neighbourhood. We should have done that. The Chinese were smarter, they did it first." He said the answer to the string of pearls "is what is called the necklace of diamonds. We are building up our bilateral military relationships with key countries in the Indian Ocean area – with Australia, with Indonesia, with Vietnam, with our neighbouring countries in South Asia, with the Gulf Cooperation Council countries. That is how we want to do it to make sure that everybody is aware that the Indian Ocean has to be kept open for everybody and no power has the right to encroach on the global commons." However, diplomatic skirmishes arising from denial of visas to certain Indian officials or China’s reported claims to certain parts of sovereign India should be handled maturely and the government must never give in to the jingoism certain sections of the media are known to whip up. Here it is important to note that the two countries have somewhat reconciled on issues like Tibet and other disputed regions. India’s concerns about Tibet arise not from the sovereignty issue of this region but from the infrastructural development taking place on the other side of the border and the damming of Brahmaputra River. Moreover, the status of Aksai Chin and Tawang remains a non-issue when it comes to socio-economic engagement between the two countries. Despite that, time and again, statements contradicting the status quo keep coming up from the Chinese government and military incursions also take place along the LAC. The bilateral talks are meant to address such issues and with the appointment of Special Representatives in 2003, the process has been further facilitated. The 15th round of boundary talks held earlier in January between Special Representatives - National Security Advisor Shivshankar Menon and Chinese State Councillor Dai Bingguo - in New Delhi resulted in the signing of an agreement for setting up a mechanism to avert any untoward incident on border. Nice Article that puts into perspective the collective wisdom of different people. Yes, China has been a big headache for India.